For those of you who were on vacation last week and missed the latest ScuttleButton puzzle, fear not … we’re holding it open for another week to give you a crack at it. President Obama, asked at his news conference on Thursday about what to do in Syria regarding the Islamic extremist threat there, said, “We don’t have a strategy yet.” While I’m sure millions of Americans were relieved to hear that, it got even more confusing when the media would ask about ISIS and the president would talk about ISIL. 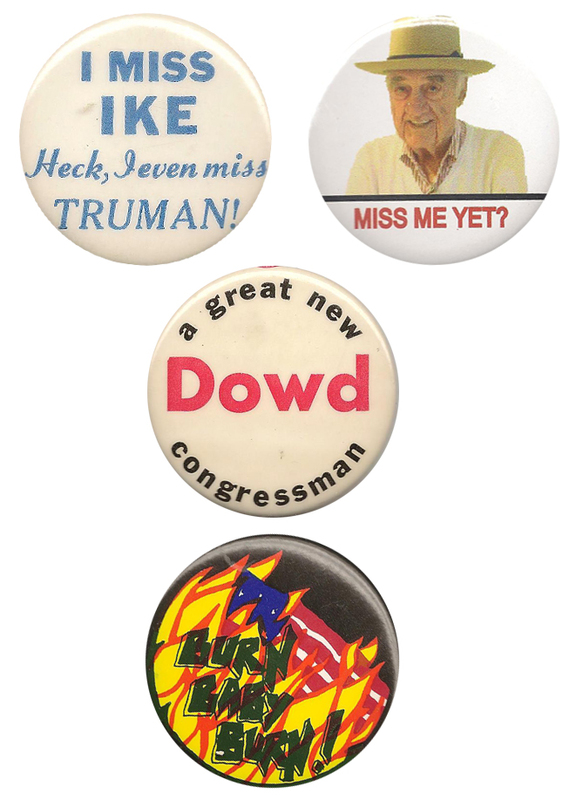 [2 buttons on the same line]: I Miss Ike / Heck, I Even Miss Truman! and Miss Me Yet? — the first is an anti-JFK button, probably 1962; the second features of photo of former Florida Gov. Claude Kirk. Dowd / A Great New Congressman — William Dowd was the Republican nominee against Rep. Jim Howard (D-N.J.) in both 1970 and ’72. Burn Baby Burn! (showing a flag on fire) — Button opposing the proposed constitutional amendment that would make illegal the burning of the flag. Mrs. Doubtfire. Another tribute to the late Robin Williams. And the randomly selected winner is … Leonard Williams of Fort Wayne, Ind. Leonard wins the coveted Political Junkie button.